Bryan with a why? : Torture Time in Tinsel Town. This shocking photograph released today shows the recent torture of a Santa prisoner of war in a Snowman labour camp. 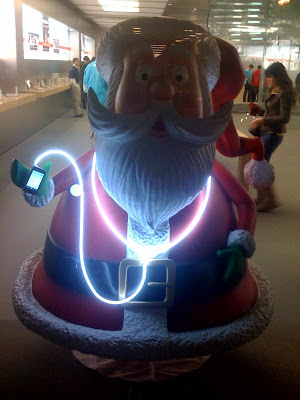 Evidently, The Santas are forced to stand for days in a window and listen to country music christmas songs on strange devices that light up and cause involuntary checking of email. When asked about the Frosties, the Santas said "they are cold so cold". 7 news has also uncovered that The Frosties and The Snowmen are actually part of the same terror cell and aim to rid the world of alliteration. This is an aim that we at 7 news strongly object. Blogging Bryan. Should he be allowed to do this?